By Matt Dillon | Business Developer | Pureflow, Inc. Many times when we are the customer or the supplier, we can view the other party as if we are dealing with “robots”. We often forget that we are dealing with living, breathing human beings. How do we break from this mindset and enter into a realm of working with “people” instead of “robots”? When we place an order, we expect it to be processed, properly scheduled, and delivered on time with quality and consistency. We presume that the supplier knows how to deliver what we want whether or not we told them exactly how we want it. Subconsciously we select suppliers that we hope will earn our trust. As a customer, how many places do you purchase from that have not earned your trust? What places do you purchase from on a regular basis? Studies show that customers purchase from a majority of the companies that have earned their trust over a period of time. If the customer/supplier relationship matters so much, then how can we invest and build lasting, trusting professional relationships? Use time, trust, & investment to build healthy relationships in life and in the workplace. People trust those who take time to invest in their lives on a consistent basis. 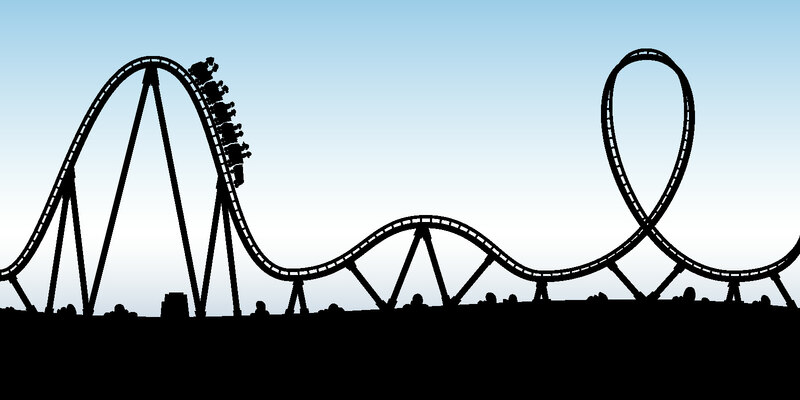 From the perspective of a customer, there needs to be a consistent track record of trustful actions performed over a period of time. A supplier needs to believe that they exist because of the customer and not in spite of the customer. When we supply customers with a product or a service, do we take them for granted and expect them to be there knocking down our door? As we read in the quote above, the supplier is to take the humble approach and truly believe that their customers are the purpose of their work. To truly invest in the relationship, there should be joy in serving the customer with excellence. The four categories of a customer/supplier relationship are all interdependent on time, trust, and investment. The relationship is established when a partnership agreement is made. From this point the relationship will either grow deeper or stay shallow. The first category of is when a new customer and new supplier are introduced. There is no trust, no time, and no investment. There is no previous knowledge of each other so no trust has been built. Both the customer and the supplier are sizing each other up to see if there is a fit for their two companies to partner together. Category 2 occurs when a large amount of trust has been given in a very short period of time. This may happen when one or both of the parties have previous knowledge of each other or one has been referred as a great customer and/or supplier. 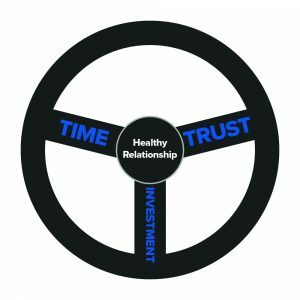 Relationships in Quadrant 2 can quickly become very successful or troubled because there is no consistent track record of time and investment to overcome a lack of trust. This quadrant is unbalanced because, like a car, for it to roll straight, the wheels has to be balanced and aligned. Time x Trust x Investment = Lasting Momentum. Just as it is hard to stop a boulder from rolling down a hill, it is hard to stop a healthy customer/supplier relationship that is built on time, trust, and investment. The third category is composed of shallow or struggling customer/supplier relationships that are caused by a history of mistrust, delayed shipments, or unmet expectations. 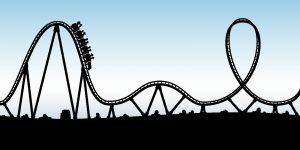 Sometimes customer/supplier relationships can travel back and forth on a roller coaster ride through Quadrants 3 and 4. There are moments of strong trust as well as moments of mistrust. If this carries on too long, eventually the relationship will cease to exist. 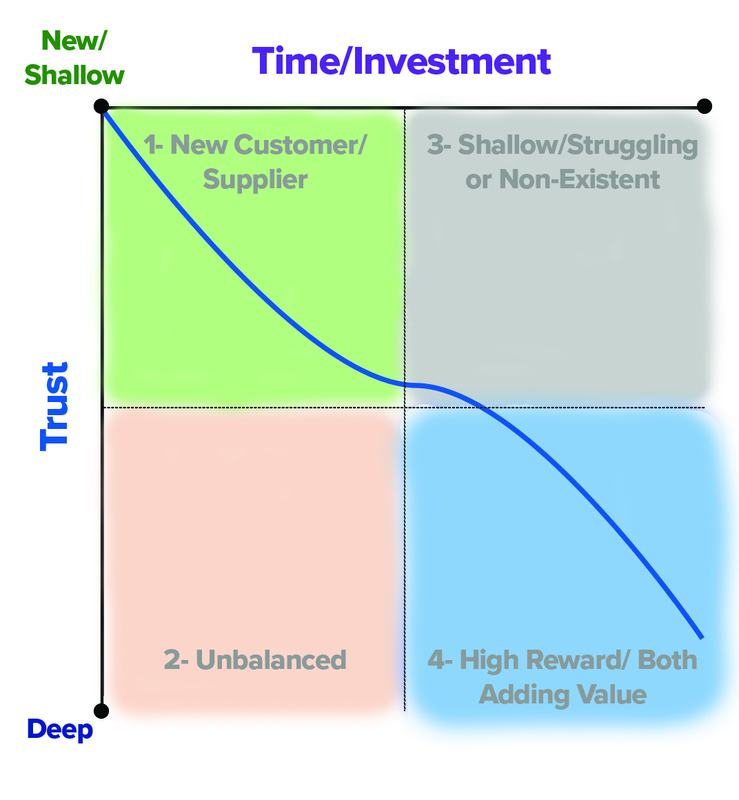 Quadrant 4 is the goal for all of your customer/supplier relationships. Both parties can accomplish this by adding value to each other. As they give each other opportunities to intentionally and consistently build and maintain trust over time, they will abide in the high reward Category 4! A supplier can add value to the customer by providing a service with excellence from the first interaction to the final delivery. The customer feels “looked out for” and respected by the supplier. 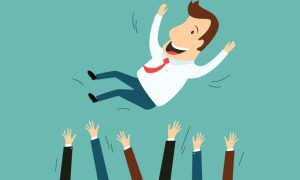 When the supplier goes above and beyond expectations to prove to the customer that they are the reason the supplier is in business, relationships are strengthened. This fourth category in a customer/supplier relationship is refreshing and incredibly rewarding for both parties. Both the customer and the supplier partner and add value to each other. 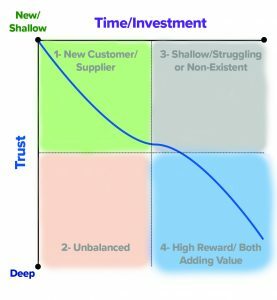 There is now freedom to trust and time for each party to make the investment needed to have a successful Quadrant 4 relationship. At times it may feel that we are in an unwanted shallow or unbalanced quadrant. The way to move any relationship through or out of other quadrants and into Quadrant 4 is by treating others as we would want to be treated. If we take time to get to know the people on the other side of the phone or email, we will find that there are a lot of people who will invest time and build lasting trust with us. One practical way of starting this process is by realizing that everyone has a desire to work with others who care and seek to add value to each other. Take time today to treat someone as you would want to be treated. Add more value to them than you receive in return! 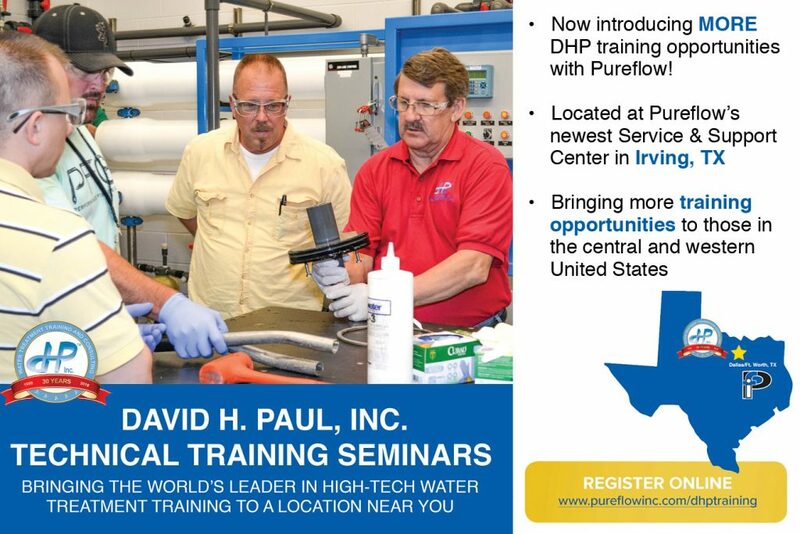 Matt Dillon is an Account Manager at Pureflow, Inc. and has been a member of the Pureflow team for four years. His project management background and extensive field experience have helped him develop a well-rounded understanding of the water treatment business. He has a passion for people with a focus on management, team building, and customer care. Currently his focus is on the development and growth of Pureflow’s Pre-engineered Division with an emphasis on the biotech and pharmaceutical industry. Article is re-printed with permission of Matt Dillon. Unauthorized reproduction of this article and/or use in any form is strictly prohibited without the expressed written consent of Pureflow, Inc.